Dahi bhalla is one of the most famous North Indian snack and a popular street food as well. It involves soaking the lentils, grinding it and then deep drying. So in order ot make healthy and quick Dahi bhalla with a twist, try out these Besan vada recipe prepared in Appam pan. Learn how to make healthy dahi bhalla without soaking, grinding and frying. 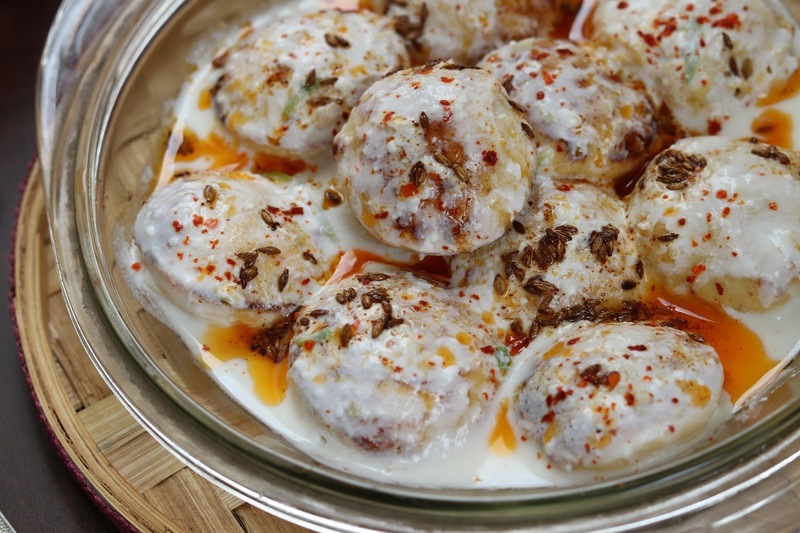 These are 3 min dahi vada made using besan, cooked in appam pan which are equally tasty and soft to eat. This is a perfect Indian snack recipe which takes no time to prepare. 1. Prepare a batter of besan, curd and all spices like salt, red chili powder , cumin seeds and cooking soda. The consistency of the batter should neither be too thick nor too thin. This is the pakora batter ready. 2. Heat appam pan an grease all cavities with oil. Pour the besan batter into each cavity. The flame should be low to medium. Allow the besan pakoras to cook and keep flipping to cook from all sides. 3. Soak the pakoras in enough water for 10- 15 min. 4. Meanwhile beat the curd and add crushed green chili, ginger and garlic along with salt and red chili powder. Mix well. 5. For tempering, heat 1 tsp desi ghee and splutter cumin seeds. Cool for 1-2 min and add coloured red chili powder. 6. Serving - Squeeze all besan pakoras or besan vadas and put it in serving plate. Top with spiced and flavored curd along with desi ghee tempering. 7. Garnish with little red chili powder. 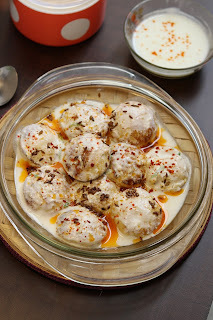 Instant dahi bhalla is ready to serve.